E-cigarettes won’t help a smoker quit? Have You Seen The New ZeroCig E-Cigar? Are you a cigar enthusiast, or someone that enjoys the occasional cigar and would like a healthier alternative? If so, then it would be well worth your time to check out the ZeroCig Disposable E-Cigar. This exciting new product brings all the enjoyment of a traditional cigar and delivers it in a healthier, cleaner, and more convenient way. The new ZeroCig disposable e-cigar has a powerful battery to help produce dense and flavorful vapor, similar to the smoke from a traditional cigar. It also provides 1,500 puffs, giving you hours of enjoyment, and is offered at a strength of 12mg. Because this is a smokeless cigar, you can even enjoy it indoors! No longer will you have to worry about a lingering smell or excess ash to clean up. If you are an occasional cigar smoker, this e-cigar is also a great option because it has a shelf life of 5 years and does not require a humidor. You have the option to buy this disposable e-cigar as a single or in a four pack. Right now we are offering a 33% discount, so take advantage of this reduced price while available. 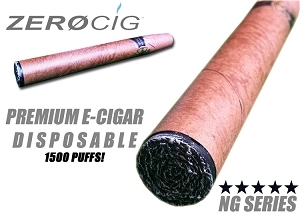 Click Here to check out the new ZeroCig Disposable E-Cigar.